I forgot what staying in a hostel was like…tried to be as quiet as possible getting up this morning, as to not disturb my roommates! 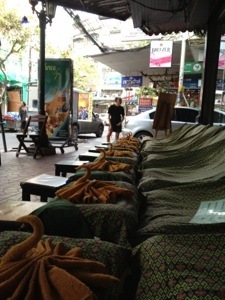 Had a late start, but wandered over to Khao San Rd and had a fabulous hour long foot massage for $7. I will not get tired of indulging like this! 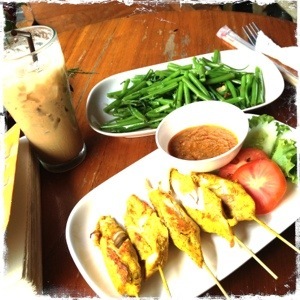 Having a lazy lunch and walk around this afternoon, but nothing too specific that I want to do today. Did the touristy highlights when I was in Bangkok with Laura and Wendy almost 2 years ago. Tomorrow, however, is weekend market shopping day! !